Guillain-Barré syndrome (GBS) is an acute, self-limited autoimmune polyneuropathy. Antiganglioside antibodies are frequently present in the acute-phase sera from GBS patients. Those antibodies are useful diagnostic markers and may be directly involved in the pathogenesis. We recently revealed that some GBS patients had serum antibodies that specifically recognize the novel epitope formed by two ganglioside molecules and named these antibodies antiganglioside-complex antibodies. We first investigated a serum from a patient with severe GBS with enzyme-linked immunosorbent assay (ELISA) and thin-layer chromatogram (TLC)-immunostaining. We first found an unidentified immunoreactive band in the position just below GD1a on TLC of a crude ganglioside fraction from bovine brain. ELISA results were negative for each of the purified test gangliosides including GD1a, GD1b and GalNAc-GD1a. But the serum IgG bound strongly to the well coated with the mixture of GD1a and GD1b gangliosides (GD1a/GD1b) (Figure). In TLC-immunostaining using a developing solvent of chloroform/methanol/0.2%CaCl2-2H2O (50:45:10), positive reaction was present in the lane in which both GD1a and GD1b were developed, but not in the lanes in which GD1a or GD1b was developed individually. 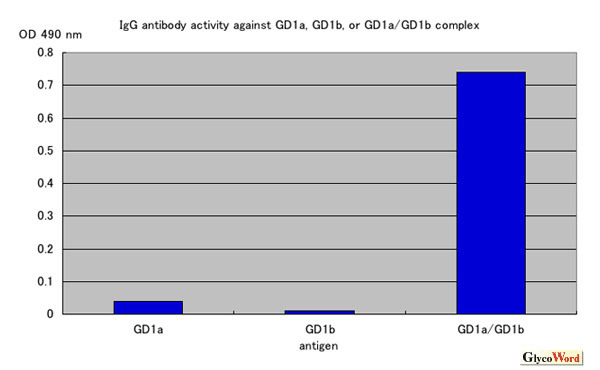 The position of the positive band corresponded to the overlapping portion of GD1a and GD1b. It is therefore indicated that mixing GD1a with GD1b produced a ganglioside complex and the antibody recognized a new conformational glycoepitope that is different from that of GD1a or GD1b alone. We next investigated antibodies in sera from 234 GBS patients using a mixture of two of the four major gangliosides (GM1, GD1a, GD1b and GT1b) as antigens. The results showed that 39 patients (17%) had antibodies against at least one of the mixture antigens. Among them, antibodies against GD1a/GD1b and GD1b/GT1b complexes are significantly associated with severe GBS requiring artificial ventilation. These antibodies against ganglioside complexes can be used as markers of severe GBS and may provide a clue to solving the pathogenetic mechanism of severe GBS. Because Miller Fisher syndrome (MFS) is considered to be a variant of GBS, MFS patients may also have anti-GSC antibodies. The presence of antiganglioside complexes antibodies in MFS was therefore investigated using seven ganglioside antigens: GM1, GM2, GD1a, GD1b, GT1a, GT1b and GQ1b. ELISA results showed that 58% of the patients had serum antibodies to ganglioside complexes such as GQ1b/GM1 and GQ1b/GD1a. Sensory signs were infrequent in MFS patients with antibodies to GQ1b/GM1. ELISA assay on a serum sample from a patient with Guillain-Barré syndrome with anti-GD1a/GD1b antibody. This patient's serum IgG reacts strongly with a mixture of GD1a and GD1b but does not react with GD1a or GD1b alone. Future study on the localization of each ganglioside complex is required. An animal model of the autoimmune neuropathy with antiganglioside complexes antibodies should also be developed. Such investigations will clarify the clinical relevance of antibodies against ganglioside complexes.